2. 120 ribbed grills with decorated rim. 3. 3 new design transparent blades (AS material) or 3 narrow blades (ABS material). 4. Oscillation (swing) is operated by. 6. Micro-switch & remote control. (1) Variety wind mode selected. (2) General wind, natural wind, slumberous. (3) 0.5 ~ 7.5 hours gradual timer. 7. Fan color available: Light gray, burgundy (red), black, dark green (hunter green), dark blue (navy blue), bright orange (lemon yellow). 1. 1 set/ctn/1.54’. 2. 650 sets/20’cy, 1300 sets/40’cy, 1500 sets/40’HQ. 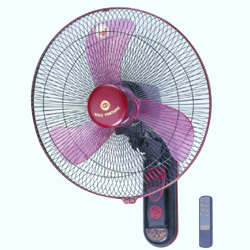 Our new developed have many advantages different from the fans in the market. They're very charming and oscillation smooth, especially our patent "Dual Free Neck" with the wider oscillation angle, you're able to use convenient more.